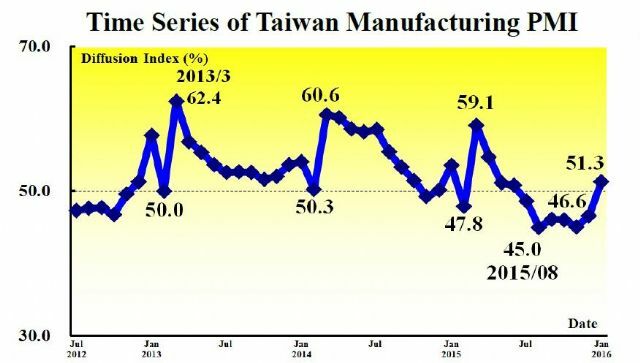 Taiwan's Purchasing Managers' Index (PMI) of the manufacturing industry increased by 4.7 percentage points from a month earlier to 51.3 percent in January, 2016, ending a downtrend over the past six months, to post the first reading above 50 percent since July 2015, according to Chung-Hua Institute for Economic Research (CIER), to which C. S. Wu, its president, attributes mainly an increase in New Orders and Production indexes. The manufacturing PMI is based on five major indicators: New Orders, Inventory Levels, Production, Supplier Deliveries and Employment Environment. Wu said that four of the six manufacturing industry categories reported growths, which, according to him, has not been seen for a long time. The four categories include: Foods & Textiles (60.0 percent, the highest in 41 months), Transportation Equipment (53.7 percent), Chemical, Biological & Medical (51.8 percent) and Electronic & Optical (50.7 percent). 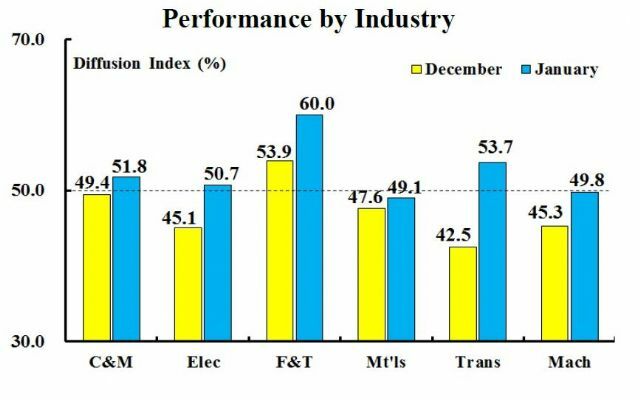 Only Basic Materials (49.1 percent) and Electrical & Machinery Equipment (49.8 percent) industries reported declines in January, CIER said. However, CIER noted that the single-month recovery does not represent a broad-based change in a growth trend, and the institute is inclined to see it as an encouraging sign resulting from a typical uptrend in holiday-related demand. At least, CIER said, the overall business climate in Taiwan is gradually touching a more stable bottom. CIER indicated that the effect of the coming Chinese New Year holidays (Feb. 6-12) influenced the manufacturing activities as New Orders and Production Indexes both reversed their recent trends of contraction to register 53.4 and 55.3 percent in January, respectively. Manufacturing employment is still in contraction for the sixth consecutive month while the Employment Index registered 1.7 percentage points higher than the 48.1 percent reported in December, 2015, CIER said. The Supplier Deliveries Index registered 51.1 percent, indicating the deliveries from suppliers to manufacturing sectors had slowed after 9 consecutive months of faster deliveries. Manufacturers' backlogs contracted for the ninth consecutive month while the Backlog of Orders Index registered a 2.3 percentage point rise over the 44.1 percent reported in December, 2015. Other data released by CIER show the Exports Index registered 50.2 percent to indicate a rather positive trend following eight months of contraction. The Imports Index registered 48.8 percent, an unexpected increase of 7.2 percentage points from last December. Manufacturers in Taiwan still continue to express anxiety towards the future, CIER said without pointing to the likely causes as widely reported frustrations over the current crude oil glut, slowing demand for commodities and economic growth in China, lingering geopolitical tensions in the Mid-East that also interrupt investor sentiment, stagflation in Japan, the impact of China-S. Korea free trade agreements on Taiwan, and the newly-elected Taiwanese president Tsai Ing-wen's policy towards China, with the Six-Month Outlook Index registering 4.5 percentage points above the December reading of 38.0 percent.